Muslims believe in God, who they call Allah, and that He sent prophets to mankind starting with Adam (as), including Moses (as), Abraham (as) and Jesus (as), and ending with the Prophet Muhammad (saw). The Prophet Muhammad (saw) was born in Makkah in 570 CE and at the age of 40 he began to preach Islam to the people around him. He migrated from Makkah to Madinah to escape persecution in 622 CE and by 632 CE the whole of Arabia had accepted Islam. The religion then began to spread further and by 750 CE the Muslim world ran from Spain to China. Islam has always merged with the cultures of those areas in which it has spread, rather than impose a particular culture on people. This is why, for example, a mosque in China looks like a Chinese pagoda and a mosque in Spain has features distinctly recognisable as Spanish. People of all colours, languages and ways of life practice Islam today and they make up the richly diverse Muslim ‘Ummah’ or ‘family’. Islam places great emphasis on learning and knowledge, indeed Muslims believe that the first word revealed to the Prophet Muhammad (saw) via the Angel Gabriel was ‘read’. This spirit of discovery led to the study of many sciences by Muslims and resulted in many great inventions that changed the world. Ibn Sina was a medieval Muslim scientist who wrote extensively on medicine. In fact the word ‘medicine’ stems from his name ‘Ibn Sina’. His most famous work was The Canon of Medicine; completed in 1025, it was still in use in Europe in the 18th Century. Muslims have always strived to build wonderful buildings. Some of the most well-known buildings in the world are the products of Muslim architects and engineers. Famous examples include the Taj Mahal in India, the Blue Mosque in Istanbul, the Alhambra Palace in Spain, and the Dome of the Rock in Jerusalem. The Muslim world has been recognised as having had a strong influence on art. Based on religious beliefs prohibiting the depiction of animals and humans, the main components of Islamic art have been floral, geometrical and calligraphic. Motifs such as the eight pointed star, the stalactite, the flower and certain geometrical and colour schemes are only a few examples found in both Islamic and European works of art. Islamic art has also been credited with influencing the European Arabesque, Rococo and Baroque styles. The influence of Muslim civilisation extends beyond science, architecture and art to European traditions of eating and drinking. The story of how coffee came to Europe is one example. The earliest reliable evidence of coffee drinking appears in the middle of the 15th century among Muslims in Yemen, where coffee beans were first roasted and brewed. By the 16th century coffee had reached the rest of the Middle East and from there it spread to Italy, the rest of Europe and America. Abul Hasan Ali Ibn Nafi, known as Ziryab, was a Muslim socialite who lived in Islamic Spain in the 9th century. Among other innovations, he is believed to be the first person to make popular the concept of the three course meal – a starter, a main course and a dessert – which is now enjoyed all over the world. Terrorism is unambiguously forbidden in Islam. Indeed, “Harm should not be inflicted nor should it be retaliated with harm”. This is a saying of the Prophet Muhammad (saw) and forms one of the most important established principles in Islamic law. It is also related to another principle that ‘harm should be eliminated’. This is due to the fact that harming is oppression and oppression is unlawful not only in Islam but in all faiths. Those who use terrorism to achieve what are often political goals have misinterpreted the religion of Islam. They are in the minority and the overwhelming majority of Muslims in the UK and worldwide reject their narrow views and misinterpretations, even though such people claim to be acting for Islam. Women are held in high esteem in Islam. The Prophet Muhammad (saw) told us that heaven lies at the feet of one’s mother. He also said: "It is the generous (in character) who is good to women, and it is the wicked who insults them." Islam gave married women the right to own their own property and wealth more than 1300 years before married women were afforded the same right in Britain, which did not happen until 1882. Islam also emphasises the right of women to be educated. This right of women to seek knowledge is not different from that of men. The Prophet Muhammad (saw) said: “Seeking knowledge is mandatory for every Muslim". The word ‘Muslim’ here includes both males and females. There are around 18,000 Muslims in Newcastle upon Tyne and they come from a range of backgrounds and ethnicities. The first mosques in Newcastle were established in Elswick by Pakistanis and Bangladeshis who came to the UK as immigrants in the 1960s and 1970s. Their children, grandchildren and now great grandchildren have been born in the UK and although many are deeply connected to their religion, they are also proud British citizens who continue to make positive contributions to British society. After confirming their faith, the foremost duty of every Muslim is to pray five times a day. Muslims try to go to the mosque to perform their five daily prayers. First they perform ablution so that they are cleansed before they pray. Then they stand, bow and prostrate in sequence to show their submission to God. They do this in the way taught by the Prophet Muhammad (saw). If Muslims are unable to attend the mosque then they can say their prayers in any clean place, such as at home or at their place of work. Ramadan is the name of a month in the Islamic calendar, which is based on the lunar calendar. During this month, Muslims engage in fasting during daylight hours. They do this because it is mentioned in the Quran, the holy book of the Muslims. Besides this, it helps to teach them gratefulness, sympathy for others less fortunate and self-restraint. It is also proven to be good for one’s health. At sunset during the days of Ramadan, Muslims often gather in the mosque or at home with family and friends to eat the first meal of the day. There is a great feeling of communal achievement among people at this time. Once a year Muslims who own a certain amount of wealth are required to give 2.5% of it to charity. In addition, donating to good causes is encouraged throughout the year in order to cleanse one’s wealth, help community projects and uplift the status of those less fortunate in society. If financially and physically able, Muslims are required to make a pilgrimage to Makkah at least once in their lifetime. 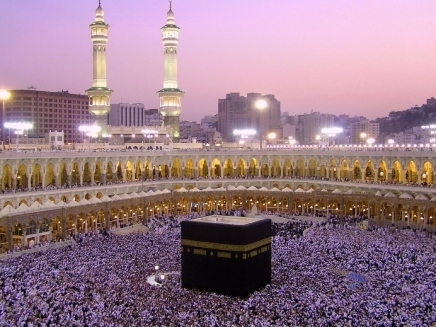 This journey is known as the ‘Hajj’ and is undertaken by Muslims from all over the world at a particular time of year. An average of 3 million people attend every year and it is one of the largest gatherings of humans in the world.